Eczema can occur into adulthood, but it typically begins during childhood. About 10% of babies have some form of eczema. In some cases, they don’t experience any symptoms as they age, and in other instances, eczema can turn into a frequently troubling condition that requires careful management. If your child has eczema, it is important to work with an allergy doctor to get an accurate diagnosis and the best possible treatments. 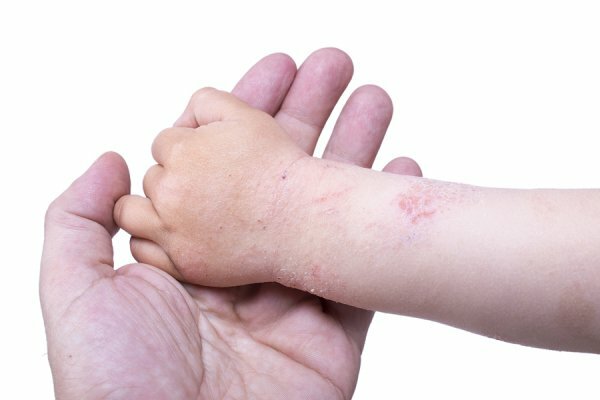 If your little one is dealing with eczema, here is what you need to know. Eczema is a general term that refers to a number of different kinds of skin irritations. There are 11 different types of eczema, from atopic dermatitis to fungal infections, lichen simplex chronicus, and allergic contact dermatitis. The first step in your child’s treatment will be allowing an allergy doctor to determine what kind of eczema he or she has. Not all types of eczema are caused by an allergic reaction, so your child’s allergist may refer you to a dermatologist for treatment in some cases. The exact way that eczema occurs is not yet understood. Most doctors believe that it occurs because of an immune reaction in which the body attacks a specific trigger. For instance, allergic contact dermatitis may occur when the body reacts to exposure to poison ivy. Eczema that persists is usually associated with an allergic reaction or autoimmune response. Generally, eczema causes a red rash and itching. Different forms of eczema cause different types of rashes. In some cases, the rash may be flat, while in other instances, it may be raised and include weeping blisters. The kind of rash your child has will help his or her allergy doctor make a diagnosis and determine the best treatment approach. Help with your child’s eczema is available from Allergy & Asthma Specialists SM . To make an appointment with an allergy doctor in Doylestown, Philadelphia, King of Prussia, Bluebell, Lansdale, Jenkintown, Pottstown, or Collegeville, dial (800) 86-COUGH, extension 2, or visit our website.